The Fart Comes on Little Cat Feet in Fart Cat! By far my favorite aspect of Fart Cat!, a fun and utterly deranged iOS game that released Wednesday, comes when you finish a level. A foghorn blares, the gassy kitty smiles and purrs, the screen fills with a stinky cloud and the game tells you, very proudly, "ROOM CLEARED." You probably will want to play this with headphones if anyone else is in the room, because the symphony of farting and mewling, accompanied by a madcap soundtrack and that no-joke horn blast, will definitely get everyone's attention. Your own chortling will probably drag a complete stranger over to see what the hell is going on, too. Fart Cat!, by Summer Camp Studios (which include alumni of 38 Studios), requires you to feed a cat his preferred poot-inducing food from one of five bays at the bottom of the screen. If he wants the tuna, flip the tuna-can icon at him. If he wants cheese, flick that. If his preferred food isn't there, touch the cat's tummy. He'll fart and the choices will reset. Your goal is to feed the cat an increasing number of food items before time runs out, which is represented by a slowly descending woman's arm, coming to pet the cat. Why anyone would want to cuddle a flatulent feline is a mystery to me, but if she pets him, Fart Cat stops farting and a chagrined look comes over him as the game ends. But if you fill Fart Cat up with the grub he wants (that is, get the item counter down to zero), touch his belly and he will, well, let 'er rip and clear the room. The later levels can be really hair-raising, requiring fast flicking and the means of seeing what Fart Cat wants and what is available through your peripheral vision. 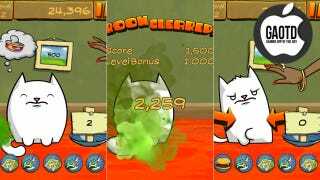 Flicking the wrong food at Fart Cat incurs a points penalty (and wastes precious time.) Resetting his food choices when there is an eligible item in one of the bays also dings you, by adding another feeding to that round's total. Fart Cat! 's humor is so sophomoric and its gameplay is so smartly focused that it's easily recommendable to immature gamers both young and old. My only problem with it was the premise: Never in a lifetime of cat ownership have I ever heard or smelled a cat fart. Do cats really fart? This one does, and that's all that matters.